Real Madrid had no problems to beat Granada last night, as they defeated their opponents by 5-1. Benzema (2), Sergio Ramos, Higuaín and Cristiano Ronaldo scored the Merengues goals, which will allow Real Madrid to obtain a temporary 6-points lead over Barcelona, who will play against Espanyol this Sunday. The game turned out as expected and Real Madrid managed to beat Granada in an easy 5-1 win. With Di María still sidelined, José Mourinho went with the Benzema & Higuaín partnership on the line-up and the Merengues showed their thirst for goals as they found the back of the net for five different times. Cristiano Ronaldo scored the last goal of the night, after a bit of a disappointing performance, in a game where the Portuguese star never appeared to be very happy with the course of the events. Does this have anything to do with FIFA's Balon d'Or ceremony and an almost pre-announced winnner (Barcelona's Lionel Messi)? The gala will be held this Monday in Zurich and Cristiano Ronaldo won't be present, as he will be preparing the Copa del Rey's match against Malaga, with the rest of his teammates. Real Madrid couldn't find an early goal, but José Mourinho's men knew how important it was to score first, in order to avoid the upsets they had been into against Malaga, in the Copa del Rey's fixture on the middle of the week. Granada presented a solid and somehow unambitious team with a clear counter-attack strategy, but Real Madrid would still manage to breach their defense lines as they opened hostilities near the 19th minute of the game. In a play that started from a brilliant touch by Cristiano Ronaldo, Mesut Ozil would slightly deflect the pass and assist Karim Benzema for the first of the night. In these kind of games, there's a general feeling that the first goal is always the hardest one and that from that point on, it would be a bed of roses. However and just three minutes later, Granada showed that they can also play some positive football and the first time they really got close to Iker Casillas, they ended up by equalizing the game, from a beautiful team play. Back to square one, as Real Madrid was now forced to go after the goal that would put them on the lead once more. The Merengues were aware that it would be crutial to charge against Granada right after, since the more time it would pass, the stronger it would become their opponents's belief in pulling off a good result from the Santiago Bernabéu. Having that in mind and close to the 34th minute, Ozil took a corner kick from the left that met the head of Sergio Ramos, The result was predictable, as the ball only stopped in the back of the net. The Spanish defender returned to the team after missing the game against Malaga in the middle of the week and what better way to mark it than scoring a goal. With the lead restored, Real Madrid became more cautious about Granada's counter-attacks and managed to reach half-time with a favorable score of 2-1. An half-time break for Real Madrid these days, means that José Mourinho will have a 15 minutes opportunity to fix what went wrong and set the best strategy to "attack" the 2nd half. Once again, the Portuguese coach showed there's something special going on in Real Madrid's locker room during half-time speeches and the Merengues would apply a final blow to Granada, in the first 5 minutes of the second half. The third goal took place on the 47th minute, scored by Gonzalo Higuaín, who showed his killer instinct after being assisted by Marcelo. The fourth would arrive right after, in the 50th minute, with Karim Benzema making his second of night, but picking an unfortunate injury, right after shooting to the back of the net. Granada knew everything was lost by that time and Real Madrid limited to control the game after that. In an individual analysis, Cristiano Ronaldo had a different attitude on this game against Granada, at least from what we've been used to see on him in these past seasons. The Portuguese player preferred to go with simple side and back passes in many occasions where he would normally take risks, like taking defenders into 1-on-1 situations or going with offensive combination plays. Still, Ronaldo would score his goal against Granada and his 26th of the season (21 in La Liga), near the 89th minute, after a strong strike from outside the area that, left Roberto with no chances to stop it. In the post-match interview, Real Madrid assistant coach, Aitor Karanka, made a note on the fact that Cristiano Ronaldo felt unhappy with his performance against Granada and that it has been precisely that, the reason why CR7 decided not to celebrate his goal during the game. Karanka: "A professional player like Cristiano Ronaldo is, had a gesture that showed how unhappy he was at that game, because things weren't going the way he wanted. He also showed his strong will of wanting to help the team", justified Karanka. Truth is, we've seen Ronaldo scoring goals after having not so good performances in past games and he usually celebrates them with rage and not indifference/sadness as it appeared to be the case last night. Could this be a reflex of the upcoming controversy around the FIFA Balon d'Or ceremony that will take place this Monday in Zurich? Real Madrid players and staff won't attend it as they are expected to be traveling to Malaga, but many public opinion polls already indicate that the award won't slip away from Barcelona's Lionel Messi. 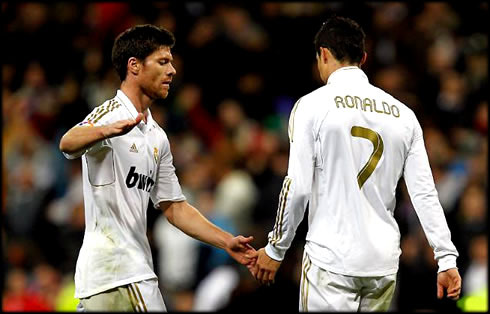 Real Madrid next match is against Malaga for the Copa del Rey 2nd leg, in the 10th of January 2012. You can watch Juventus live stream, Chelsea vs Portsmouth, as well as Manchester City vs Manchester United and Espanyol vs Barcelona from our soccer live streams section. Cristiano Ronaldo is expected to be on the line-up against Malaga.